I buid DIY passive 3D system with dual HD projector, JVC DLA-HD750. 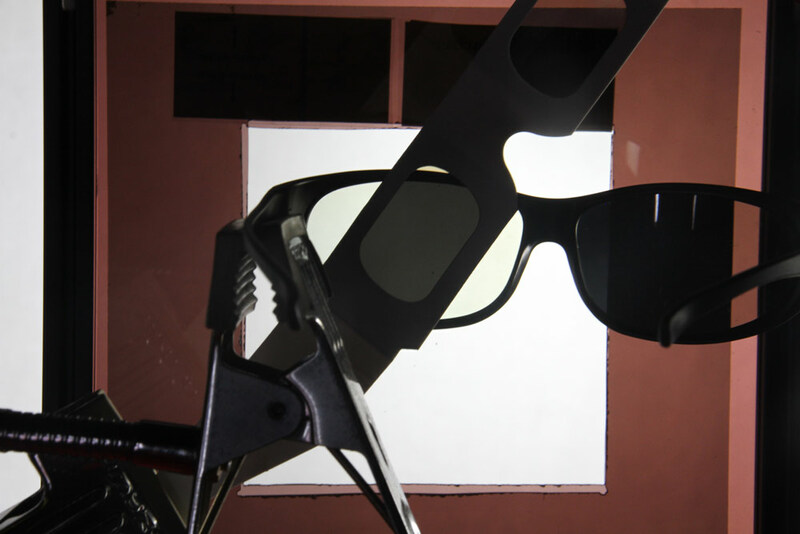 The other major components in this system consist of passive 3D source component, polarizing set and silver screen. 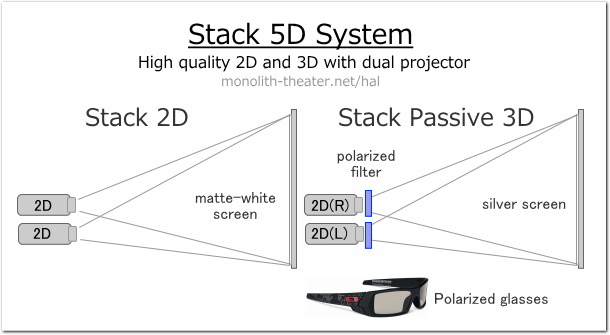 In this article, summary of my polarized passive 3D and stack 2D system whick I named stack 5D system is described. 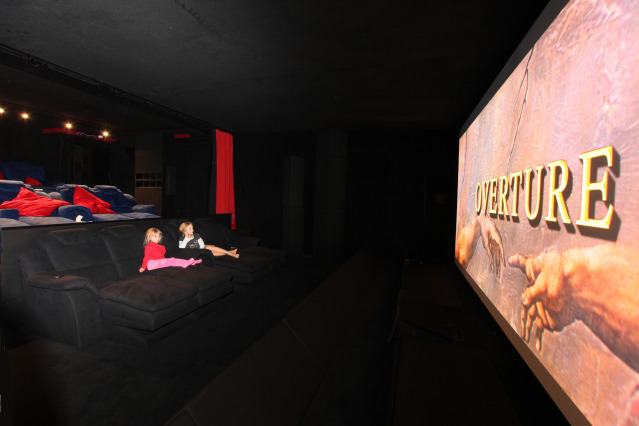 Online reviews of passive 3D in home theater suggests the difficulties and expensiveness. 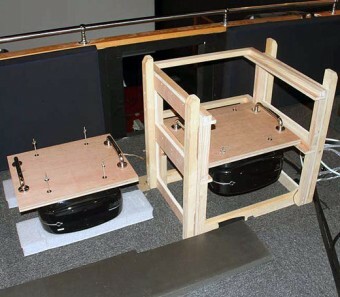 Consumer model for dual projection system is very expensive and limited in models, On the other hand, DIY tryals are not uncommon among enthusiasts. I’ve tried DIY passive system during about one year. Continuous struggle and troubleshooting storm has attacked me, but I think I could finally overcome, The process was satisfactory as a hobby. 1. 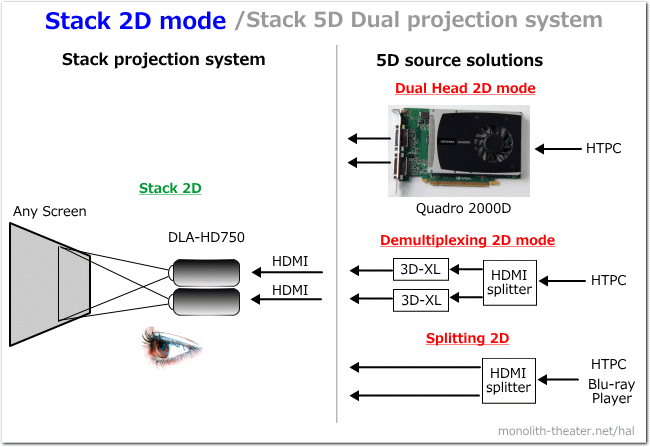 DIY passive 3D dual projection and stack 2D system, In other words, stack 5D system. 2. 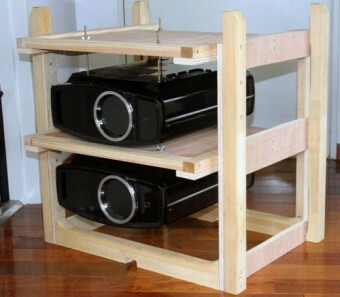 DIY PC with NVIDA Quadro dual head enables dual monitor outputs for stack passive 3D. 3. 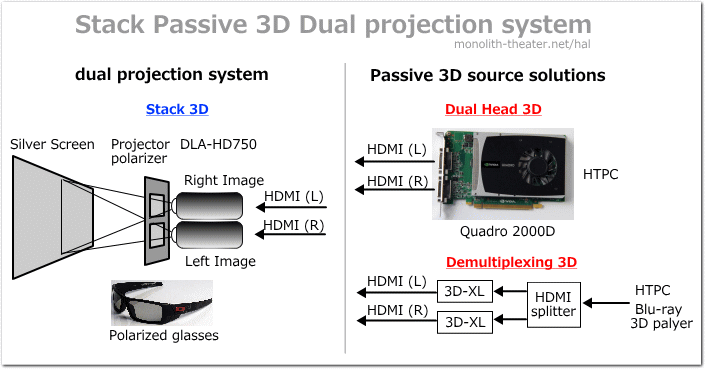 Optoma 3D-XL as demultiplexer of HDMI1.4 frame packing 3D signals also enables stack passive 3D. 5. 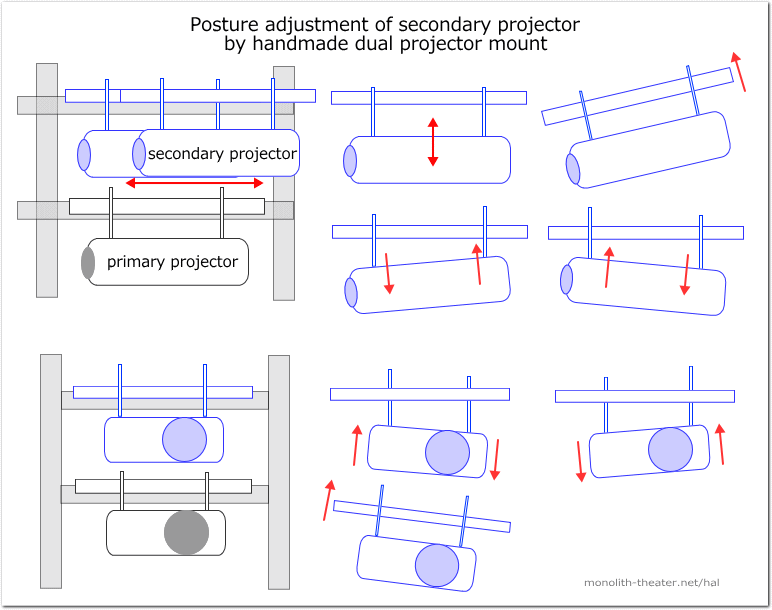 DIY dual projector mount with the ability to assist for secondary projector exact registration. 7. Passive 3D viewing with both eyes obviously superior to active 3D with viewing only one eye in stereocsopic video performance. 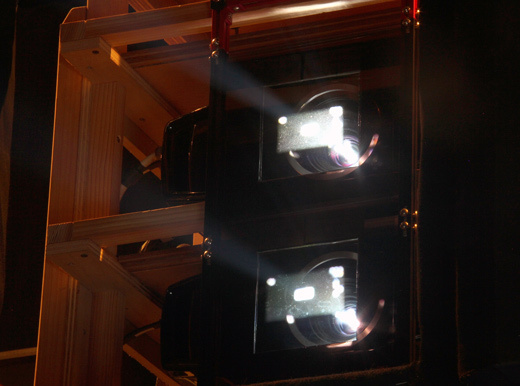 Stack System with Dual Projector, history and characteristics. Why it should be? Timothy Fernandez. 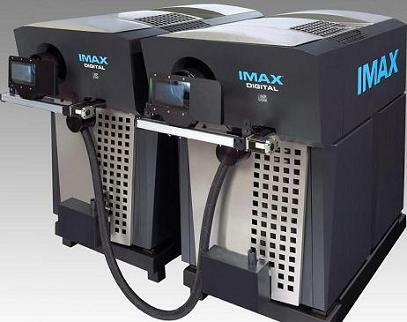 (2011) An overview: RealD 3D vs. Imax Digital 3D . asia.cnet.com, [online] May 30, Available at: http://asia.cnet.com/an-overview-reald-3d-vs-imax-digital-3d-62208932.htm [Accessed: 28th Nov 2011]. 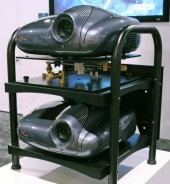 barco (2011) An Integrated Solution for 3D Visualization, [online] Available at: http://www.barco.be/en/simulation_virtualreality/product/544/features [Accessed: 28th Nov 2011]. 吉川慈人. (2011) PortableVRの紹介. VizJournal, [online] Available at: http://kgt.cybernet.co.jp/viz-journal/contents/ver1/newprod/pvr.html [Accessed: 28th Nov 2011]. 大口孝之.eiga.com (2008-2011) 第三の革命　立体3D映画の時代,第1回-11回 [online] Available at: http://eiga.com/extra/oguchi/1/ [Accessed: 28th Nov 2011]. pro.sony.com. 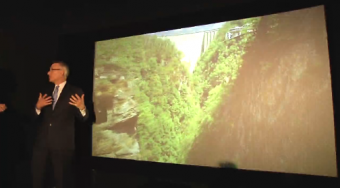 SRX-R320 4K Projector-3D Lens Change Demo, [online] Available at: http://pro.sony.com/bbsc/video/channels-hiresprojectors/video-srxr3204kprojector_3dlenschange/ [Accessed: 28th Nov 2011]. 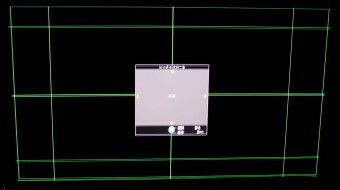 Youtube.com (2011) What is IMAX 3D? , [online] Available at: http://www.youtube.com/watch?feature=player_embedded&v=lM3zNImMwH8 [Accessed: 28th Nov 2011]. 財団法人デジタルコンテンツ協会 (2007) デジタルシネマに関する調査研究報告書, [online] Available at: http://www.dcaj.org/report/2006/data/dc07_06.pdf [Accessed: 28th Nov 2011]. 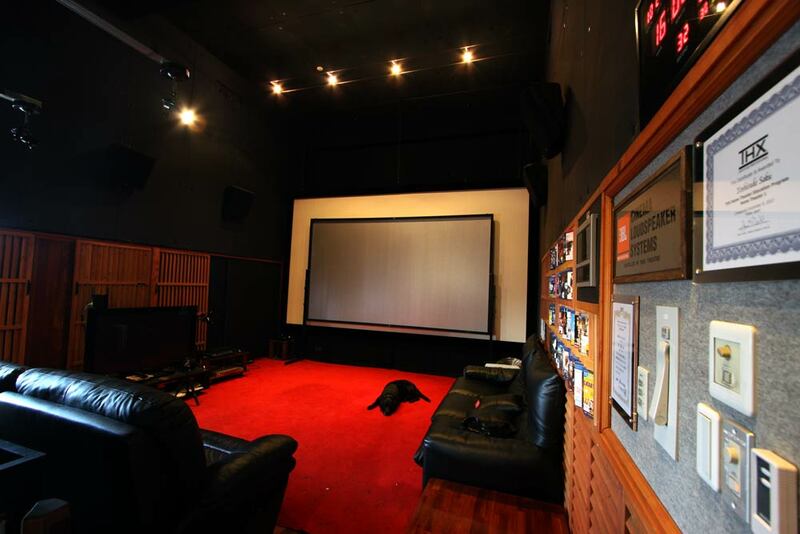 Barco DP4K-B32 stack in home cinema. Available at: http://www.avsforum.com/avs-vb/showthread.php?t=1346057 [Accessed: 28th Nov 2011]. jptheking. 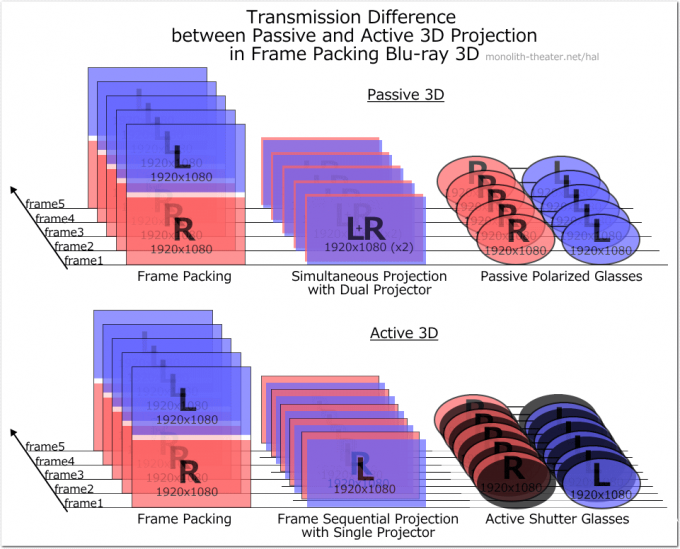 (2011) PROJECTION 3D PASSIVE IDEALE. cinetson.org, [Forum] 20th Dec 2011, Available at: http://www.cinetson.org/phpBB3/sources-diffuseurs-f109/projection-passive-ideale-t35152.html#p604778 [Accessed: 23th Dec 2011]. 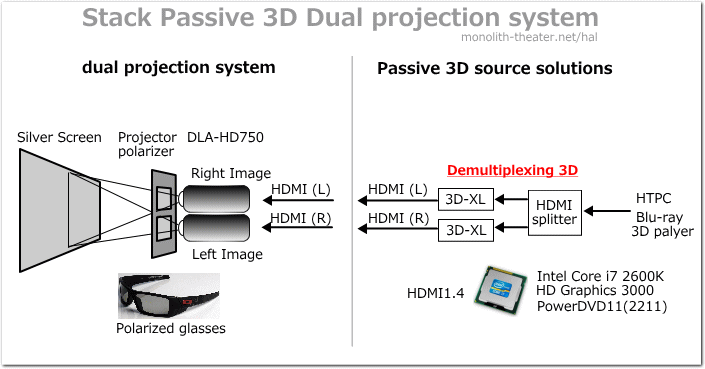 Don Woligroski, tomshardware.com, (2010) Hardware: Dual-Projector 3D Theater Checklist , [online] Available at: http://www.tomshardware.com/reviews/3d-polarized-projector,2589-6.html [Accessed: 28th Nov 2011]. 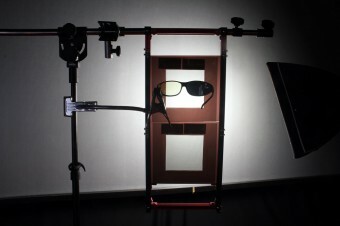 BlackShark,mtbs.com, (2010) My Passive polarised Dual-projector setup, [online] Available at: http://www.mtbs3d.com/phpbb/viewtopic.php?f=122&t=11320&sid=794e2dff01899c67fd9e6cedd1699569 [Accessed: 28th Nov 2011]. rdjam, avsforum.com (2010) The Ultimate 3D projection system: A Practical Discussion Thread , [online] Available at: http://www.avsforum.com/avs-vb/showthread.php?t=1280393 [Accessed: 28th Nov 2011]. devily,avsforum.com (2009) Home Theatre 3D Stereoscopic Projection + DIY Silver Screen for 3D , [online] Available at: http://www.avsforum.com/avs-vb/showthread.php?t=1105843 [Accessed: 28th Nov 2011]. hwangster123, Youtube.com (2011) Runco 3Dimension™ D-73d Projector Unboxing Pt. 1. , [online] Available at: http://www.youtube.com/watch?v=oMrEp9H2G-4 [Accessed: 28th Nov 2011]. SocalHidef, Youtube.com (2011) Runco 3Dimension™ D-73d Projector Unboxing Pt. 2. , [online] Available at: http://www.youtube.com/watch?v=qRKZCV4mfIw [Accessed: 28th Nov 2011]. W.Mayer, avsforum.com (2011) World Premiere 4K 3D DLP passive Stack, [online] Available at: http://www.avsforum.com/avs-vb/showthread.php?t=1346057 [Accessed: 28th Nov 2011]. George Walter, residentialsystems.com (2011) Four Reasons to Avoid Stacking Projectors for Passive 3D Installs, [online] Available at: http://residentialsystems.com/blog/53852.aspx [Accessed: 28th Nov 2011]. George Walter. 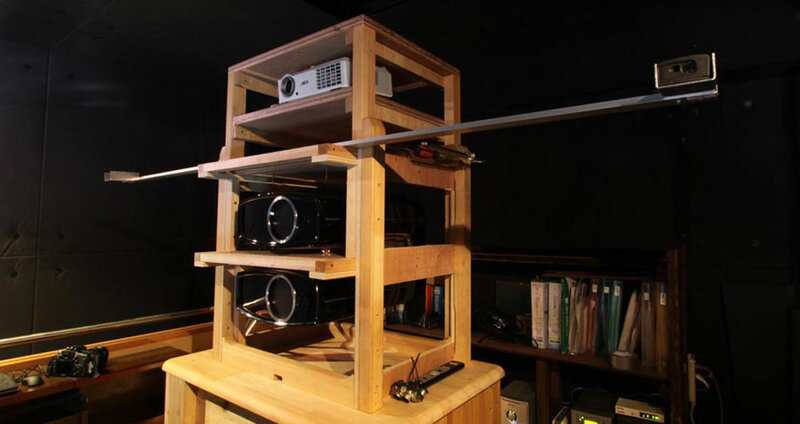 (2011) The Dangers of Stacking Projectors for Passive 3D. 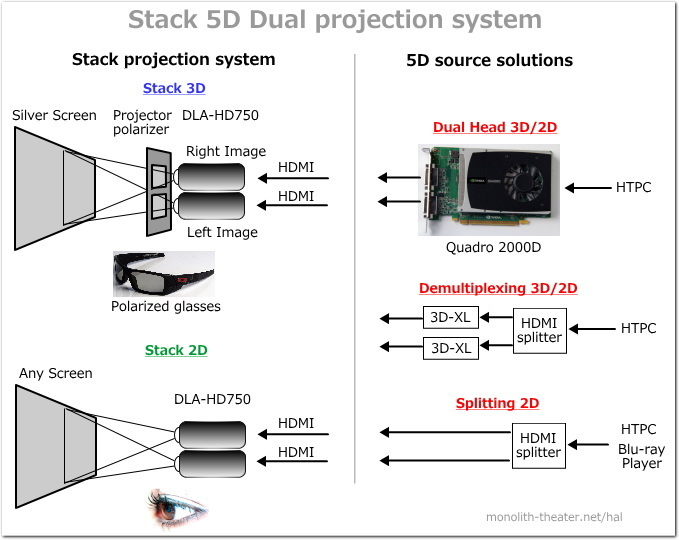 cepro.com, [blog] Feb 15, Available at: http://www.cepro.com/article/the_dangers_of_stacking_projectors_for_passive_3d/ [Accessed: 28th Nov 2011]. Pacific University Oregon (2011) College of Optometry EyeClinics, [online] Available at: http://www.pacificu.edu/optometry/patients/clinics/ [Accessed: 28th Nov 2011]. Don Woligroski. (2010) Build Your Own: Wall-Sized 3D Gaming, Just Like Theaters Do It . tom’s hardware, [Article] March 30, Available at: http://www.tomshardware.com/reviews/3d-polarized-projector,2589.html [Accessed: 28th Nov 2011]. Patrick Miller and Tim Moynihan. (2011) Active 3D vs. 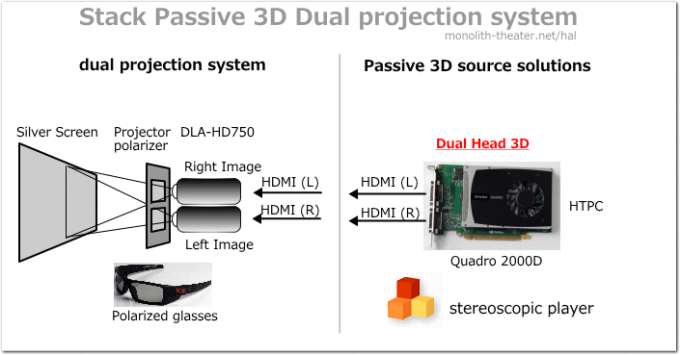 Passive 3D. PCWorld, [Article] Apr 15, Available at: http://www.pcworld.com/article/225218/active_3d_vs_passive_3d.html [Accessed: 28th Nov 2011]. 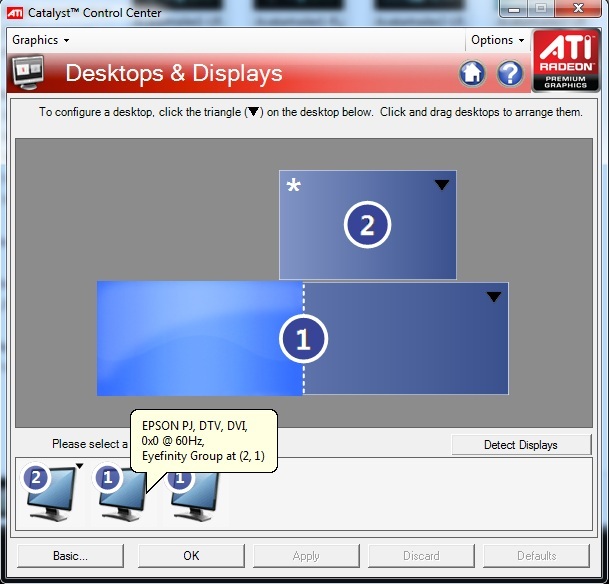 CEPro (2010) Best 3D Demos at CEDIA, [online] Available at: http://www.cepro.com/slideshow/image/7247/ [Accessed: 28th Nov 2011]. Runco.com (2011) Runco 3Dimension Series Projectors, [online] Available at: http://www.runco.com/products/projectors/3dimension/ [Accessed: 28th Nov 2011]. John Sciacca. (2011) First Look! Runco D-73D 3D Video Projector. JOHN SCIACCA WRITES…, [blog] March 17, 2011, Available at: http://johnsciacca.webs.com/apps/blog/show/6442386-first-look-runco-d-73d-3d-video-projector [Accessed: Jn 4th, 2012]. Wikipedia (2011) Wobulation, [online] Available at: http://en.wikipedia.org/wiki/Wobulation [Accessed: 28th Nov 2011]. Kevin C. Tofel, q. (2005) Wobulation: solid pic or shaky science?. engadget, [blog] Oct 17th, Available at: http://www.engadget.com/2005/10/17/wobulation-solid-pic-or-shaky-science/ [Accessed: 28th Nov 2011]. Wikipedia (2011) Distortion (optics), [online] Available at: http://en.wikipedia.org/wiki/Distortion_(optics) [Accessed: 25th Nov 2011]. STEREOeYe 「立体写真」業務日誌 (2007) [工作] ３Ｄ用プロジェクター台, [online] Available at: http://stereoeye.tea-nifty.com/blog/2007/11/post_a8aa.html [Accessed: 25th Nov 2011]. SilverTabric (2011) High Transmission Polarizers- Professional Passive 3D with any LCD or DLP™ Projector -, [online] Available at: http://www.silverfabric3d.de/html/sf_polarizers.htm [Accessed: 29th Nov 2011]. Adam Gregorich. 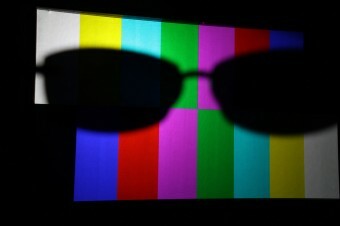 (2011) Polarization Of Consumer Projectors Lcd And Lcos. 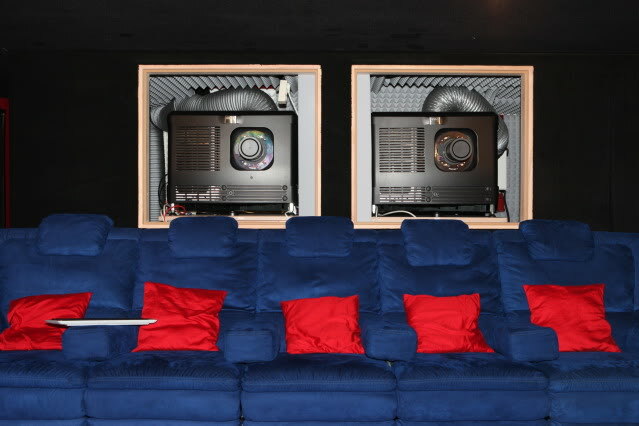 Home Theater Forum, [blog] 28th Oct, Available at: http://www.hometheaterforum.com/a/polarization-of-consumer-projectors-lcd-and-lcos [Accessed: 28th Nov 2011]. polarization.com (2009) PFC-Pair Sample of Left and Right Circular Polarizers, [online] Available at: http://www.polarization.com/polarshop/product_info.php?cPath=22&products_id=34 [Accessed: 25th Nov 2011]. 3dlens.com (n.d.) フレネルレンズ, 偏光板, [online] Available at: http://www.3dlens.com/japan/polarizer.php [Accessed: 25th Nov 2011]. The 3D market (n.d.) Polarized 3D, [online] Available at: http://the3dmarket.com/collections/polarized [Accessed: 25th Nov 2011]. 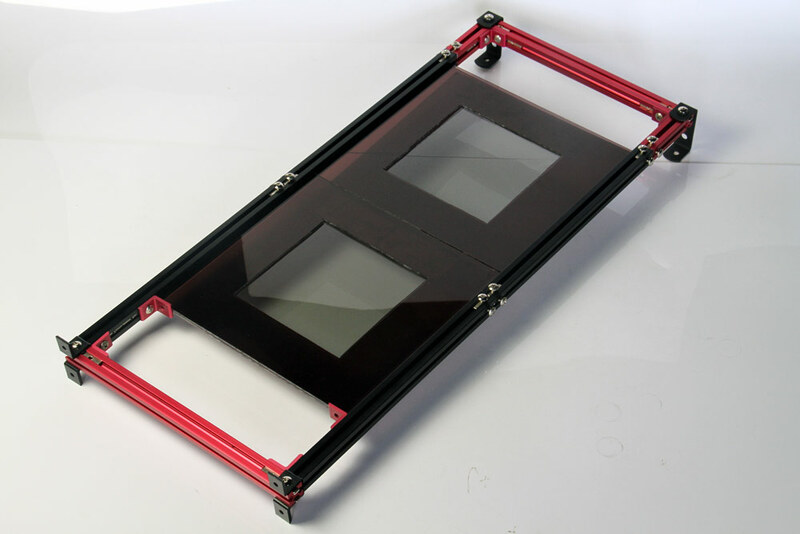 INITION (n.d.) Inition Polarising Filters, [online] Available at: http://www.inition.co.uk/3D-Technologies/inition-polarising-filters [Accessed: 25th Nov 2011]. ソリッドレイ研究所 (2011) 3Dメガネ・偏光板, [online] Available at: http://www.solidray.co.jp/product/eizou/megane.html#4 [Accessed: 28th Nov 2011]. MeCan Imaging (2011) 偏光板・円偏光板・λ板（位相差・波長板・鋭敏色フィルム, [online] Available at: http://www.mecan.co.jp/original/polarizer/index.html [Accessed: 28th Nov 2011]. Tru3D (2011) 3D Polarizing Adapters & Filters, [online] Available at: http://www.tru3d.com/3D_Accessories/3D_Converters.php [Accessed: 28th Nov 2011]. 橋本渉,(1999) 偏光に関するまとめ. [online pdf.] 15th Nov, Available at: http://www.is.oit.ac.jp/~whashimo/server/~whashimo/Article/henkou.pdf [Accessed: 28th Nov 2011]. with THX Audio and Visual Certification (ISE 2011). 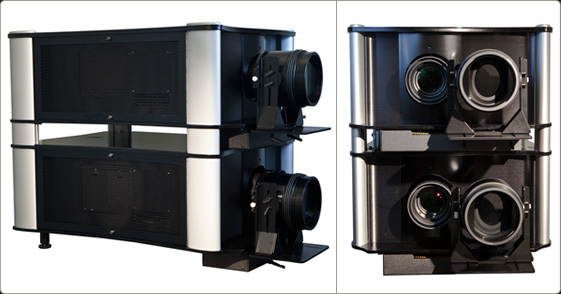 cinenow (2011) Stewart Filmscreen Silver 5D Screen for Both 3D and 2D with THX Audio and Visual Certification (ISE 2011). [ online video] Available at: http://www.cinenow.co.uk/videos/2856-stewart-filmscreen-silver-5d-screen-for-both-3d-and-2d-with-thx-audio-and-visual-certification-ise-2011 [Accessed: 28th Nov 2011]. SilverFabric (2011) SilverFabric™ Silver 3D, [online] Available at: http://www.silverfabric3d.de/html/sf_silver3d.htm [Accessed: 28th Nov 2011]. Harkness Screens (2011) Spectral™ 240, [online] Available at: http://www.harkness-screens.com/digital-3d-projection-surfaces-spectral240.html [Accessed: 28th Nov 2011]. Stewart (2011) Silver 5D, [online] Available at: http://www.stewartfilmscreen.com/residential/materials/3d/silver5D_residential.html [Accessed: 28th Nov 2011]. 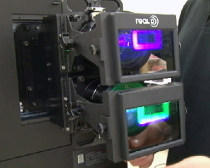 ravepubs (2011) Stewart Intros New Silver 5D Screen Material for 3D . [video online] Available at: http://www.youtube.com/watch?v=l-zx-zUeNZ0 [Accessed: 28th Nov 2011]. Kikuchi Screen (2011) ファインシルバースクリーン, [online] Available at: http://www.kikuchi-screen.co.jp/catalog/pro/pdf/pro18part30.pdf [Accessed: 28th Nov 2011]. オーエス (2011) シルバー（3D型）, [online] Available at: http://jp.os-worldwide.com/notes/osscreen/front/cloth_sd.html [Accessed: 28th Nov 2011]. KIC (2011) 3Dシルバースクリーン（Real-D）3D24（GAIN2.4）, [online] Available at: http://kic-corp.co.jp/screen/3d24.html [Accessed: 28th Nov 2011]. 日本ウエーブロック (2011) 3D用シルバースクリーン, [online] Available at: http://www.wavelock.co.jp/shop/2/maker/8/item/WLSCREEN/ [Accessed: 28th Nov 2011]. 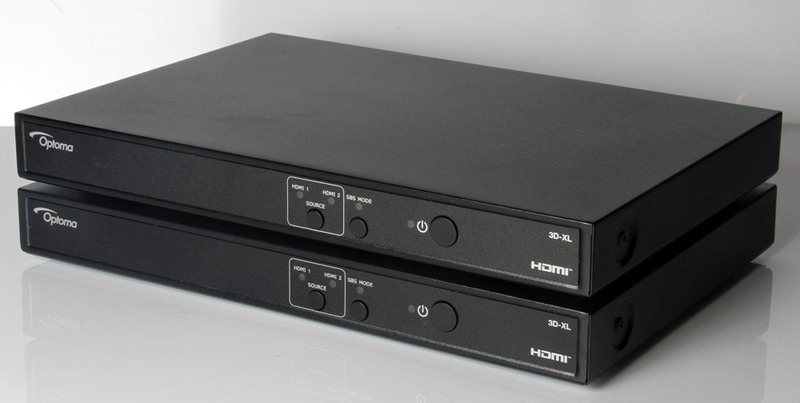 *Ultra High-End audio and Home Theater Forum. 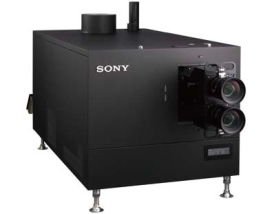 (2011) Runco’s Best-In-Class 3Dimension D-113d Projector Shipping. Ultra High-End audio and Home Theater Forum, [Forum] Jan 3, 2012, Available at: http://www.ultrahighendforum.com/viewtopic.php?p=17501&sid=ba5b69f654d4e01bbdb1d27829486fc4#p17501 [Accessed: Jan 4, 2012]. *Rachel Cericola. (2011) Runco Starts Shipping 3Dimension D-113d Projector. electronic house, [blog] Jan 04, 2012, Available at: http://www.electronichouse.com/article/runco_starts_shipping_3dimension_d-113d_projector/?utm_source=eh&utm_medium=rp [Accessed: Jan 05, 2012]. 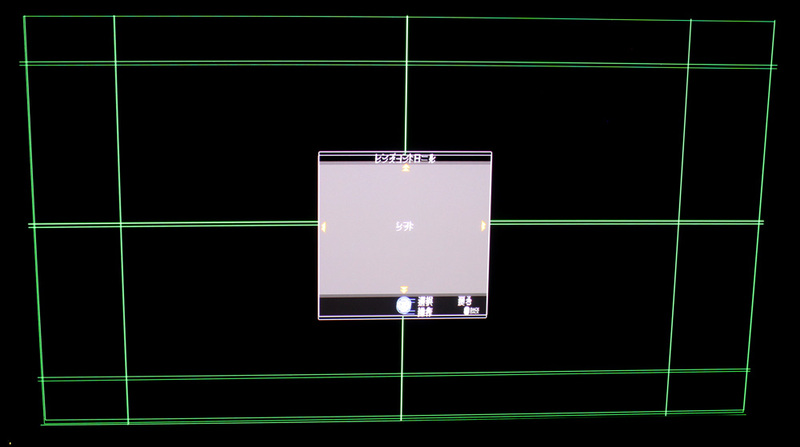 Bill Livosli,(2011) Optoma 3D-XL 3D Projector Adapter Review. Projector Central, [blog] May 2, Available at: http://www.projectorcentral.com/optoma_3D-XL_review.htm [Accessed: 28th Nov 2011]. 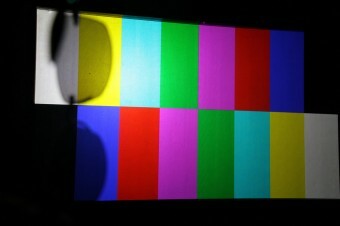 Stephen Withers,(2011) Optoma 3D-XL 3D Projector Adapter Review. AVForum, [blog] 21st June, Available at: http://www.avforums.com/reviews/Optoma-3D-XL-3D-Projector-Adapter-Review.html [Accessed: 28th Nov 2011].